I don't think I can leave it at that picture. I need to elaborate. I'm very sorry, but I like talking so much. 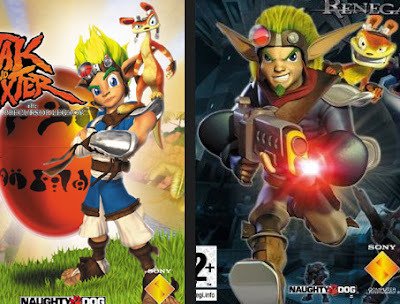 Here's how Jak & Daxter differs from the rest of the series. That game was a decent, inoffensive, light-fantasy, sub-Zelda 3D platformer which exhibited a cloyingly 1995-hip sensibility. That's a recognised genre by the way. Jak & Daxter's the only game that qualifies, though, maybe it's too specific. I'm actually not as indignant about this attitude adjustment as I was when the exact same thing happened with Prince of Persia a year later. Because this was absurd. "Gordon, I'm so glad you're alive!" "RRR, LET'S BUST SOME HEADS"
Jak II is utterly insane in a very special way. What I've just described occurs in the first two minutes of the game. Then they break out the guns. In Jak & Daxter you killed monsters by jumping on their heads. Naughty Dog wastes absolutely no time in destroying the coherence of this series. How did they think they'd get away with it? Obviously, they did. But the disconnect here is staggering. 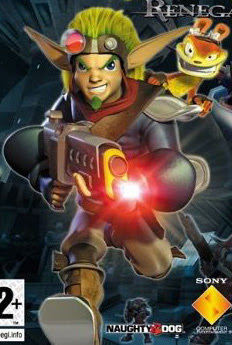 Jak is comically off-putting in this game. Selfish, moronic and hyper-aggressive, this fantasy hero is a carjacking thug on a quest for blood. The whole story is presented so earnestly and then Jak walks in and sneers about how tough he is. He's a high school bully hiding his cracking voice. I don't know this idiot is able to navigate the complex-if-super-generic plot of the game. I don't know how this idiot is able to dress himself. Jak, like everyone else in the game save Daxter, is so incredibly serious about this tale of prophecy and rebellion that it's embarrassing when it's not hilarious. It's a bad story. It's bad dialogue. They're bad characters. But I'm not complaining. The whole monstrosity is so indescribably stupid that I actually sort of love it. I connected with these dumb characters more than those in any middle-of-the-road narrative-driven game. I didn't like them. I didn't care what happened to them. But they -- the whole thing, really -- were so magnificently stupid and angry and juvenile that I was engaged. I never got past bemusement with this game. 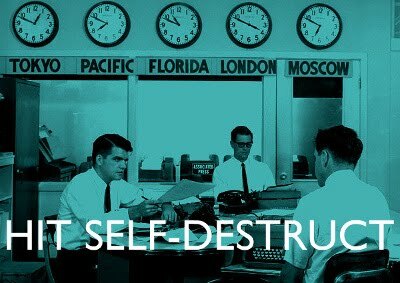 Maybe if I had then I'd be ready to dismiss it. But I never stopped marveling at it, and it never stopped entertaining me (however indirectly.) Jak II evoked legitimate enthusiasm in me. I would much rather watch this terrible character do stupid things than I would an average character do acceptable things. To this day I'm not sure if I like this game. I don't believe I do. But I can't hate it.